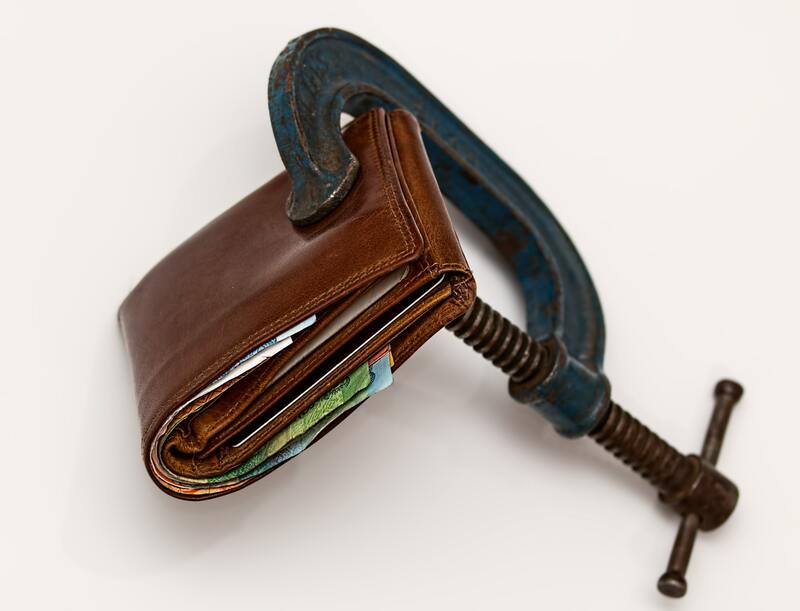 According to the latest data from the Federal Reserve Bank of Kansas City, the average size of farm operating loans in the fourth quarter reached record levels. The volume of non-real estate farm debt continued to increase in the fourth quarter of 2018. The increase was driven by growth in operating loans, which reached a historically large average size. Rounding out a year characterized by lower farm incomes, uncertainties about agricultural trade and the growth of lending volumes, interest rates on agricultural loans trended higher. The mounting combination of higher leverage and rising rates could put additional pressure on some farm operations. Bank economists Nathan Kauffman and Ty Kreitman examined the latest quarterly data from commercial lenders in the 10th District, and found that continued financial pressures in the farm economy have farmers taking on more debt to cover current operations. At the same time loan volumes are going up, so are interest rates (more debt = more risk). The bank found that 40% of non-real estate loans were now carrying an interest rate >6%. In big picture terms, the latest survey of commercial lenders found that the overall volume of farm loans from commercial banks has “increased at an above-trend rate for nearly four consecutive years and [has] not declined year over year in any quarter since 2011.” And while delinquency and bankruptcy rates remain well-below historic averages, both have inched upward along with total debt and interest rates. Astute observers won’t be surprised by these latest financial revelations. Farmers have faced stiff headwinds in recent years, exacerbated by President Trump’s trade war with China. Since the trade dispute, soybean prices have generally held below $9 per bushel, with some spot markets violating the $8 mark; corn prices have hovered around $3.50 per bushel. Livestock producers, perhaps most notably in the dairy sector, haven’t fared much better, and the outlook for 2019 isn’t terribly rosy. A December analysis from the University of Illinois noted that total returns to dairy production have exceeded total economic costs only once out of the last ten years and further that farmers should see negative returns in both 2018 and 2019. U of I’s Gary Schnitkey suggested in late December that Trump’s Trade War could bring those kinds of negative returns to grain farmers as well. For 2019, incomes could average negative for many farms if corn prices continue to be near $3.50 and soybean price average around $8.50. In this price scenario, average net income on Illinois grain farms could average near -$60,000 if yields return to trend levels. Exceptional yields like those in the last several years could cause incomes to be near $0, or roughly 2015 levels. Schnitkey expounded on the theme in a follow-up article this earlier this week: “At this point, it seems likely that net farm incomes will be very low in 2019.” Rising costs and lower prices will squeeze farmer margins. 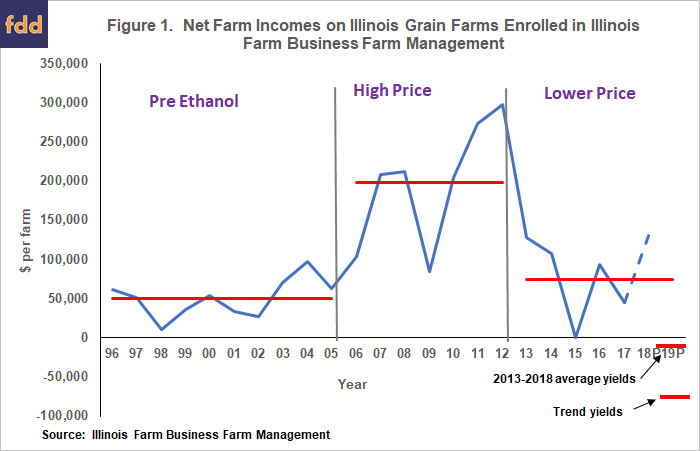 Image from: Grain Farm Income Outlook for 2019: Negative Incomes Ahead? Given the prospects for higher costs and lower prices, one might anticipate increasing farm loan volumes for the foreseeable future.